This is the most astounding theory of how dreaming works. 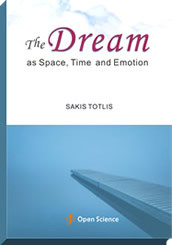 This time the explanations do not depend on the analysis of the dream symbols but on the true cause of their very existence, sentimental energy, the administration of which is explained in this book in all pertinent details. It is the first time anyone says that dreams happen for our brain to administer internal emotional energy with the sole purpose to bring back a precious energy balance for ourselves, as we all ultimately wake up with a characteristic sense of quietness and bliss. Energy administration and internal balance is the constant and ultimate target for all that is achieved and happens automatically every night in the most complicated and marvelous way. Dreaming is readily available to all but no one is ever wiser how this miracle actually works. Nature is a lot more cunning than anyone might expect. He is a well-known author in Greece, having published many literary, psychological, philosophical and historical books.